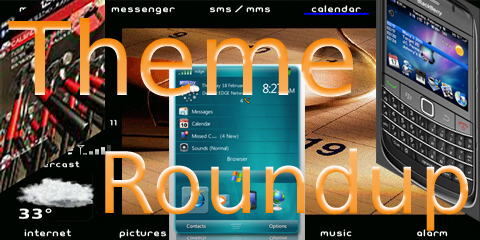 BlackBerry Theme Roundup for February 22nd 2010 - 25 Copies of Big Picture HD to be Won! Contest: 25 Copies of Big Picture HD to be won. Leave a comment! Happy Monday BlackBerry theme lovers! It's time again for our weekly theme roundup. We have spent the last week digging through our tips and through the forums, to try and bring you the best themes we can find to grace your BB. Click through the jump to get our top picks, we have some really good themes to feature this week, and a contest along the way. Our free touchscreen theme of the week is Another Brick in the Wall by tom costello. While paging through the forums, I came across this theme and remembered running it on my Storm a few months ago when it came out. 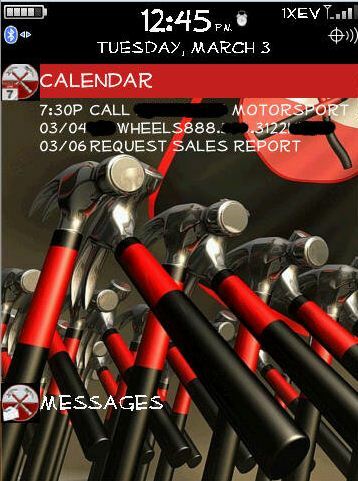 If you're a fan of Pink Floyd's The Wall, you'll love this simple variation on the stock 9530 theme. The theme features "Wall" inspired icons and some of the wallpapers we have come to know and love from that classic, making for a great look to change things up on your device. Our top pick for paid non-touchscreen devices is Big Picture HD by CTThemes. Chris dropped us a line last week to give us a heads-up on his latest release, and gave me a chance to give it a go before he did so. 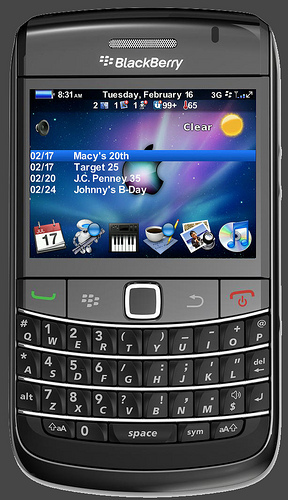 Now, I have said before how much I like the stock theme on my BB, but this one took my homescrren in a whole new direction, and I have to say, I liked it. Completely rearranging the homescreen for optimum functionality, it features 10 locked tabs for the most often used applications lining the top and bottom of the screen. Add in the 9-icon hidden dock, and a weather slot on the left, and I hardly ever have to leave my homescreen to get to anything I want to launch. One of the coolest feature with this theme is the huge HD pics that slide in when you highlight the corresponding tab for apps such as the Browser or Messages, and highlighting the icon in the weather slot gives you a clean look, perfect for showing off whatever wallpaper you happen to be rocking at the time. Available for the 8900, Tour, and 9700, you can pick it up in the CB store on sale for $2.99. Over the last few weeks, we have covered a few different "platform clone" themes, including the Hero Sense UI, iPhone, and Nexus platforms. So, it only seemed fitting that we would show WinMo some love this week. That brings us to this weeks paid touchscreen selection, WinMobile 6 v2 by MBCustomz Themes. If you love the look of Windows Mobile, and want to add that look and feel to the beauty of your touchscreen BB, this theme will have you in heaven from the word go. Featuring a weather slot, today area, and a user-definable hidden dock, the function of the homescreen is on par with what you would expect. Clean simple "Windows" style icons round out the theme, and every component has been skinned to give you an all around WinMo feel. Available for all devices running 4.6+ OS, it's available in the CB store for $6.99. Contest: We have 25 copies of Big Picture HD to give away. Just leave a comment on this post to enter. Contest ends this Sunday at Midnight PST. Please only leave one comment, multiple entries wont count.